The November 6 content update will remove Prize Crates and add the new Race Shop feature. The Race Shop is a one-stop location to pick up Mod Cars, Driver Gear suits, and Badges, using in-game credits. The combination of offerings resets every 6 minutes, shown by an on screen timer. You can access the Race Shop from the home menu, from the Driver Gear menu, and from pre-race setup menus where you apply Mods. Turn 10 is looking for feedback on the feature, so once the update installs tomorrow (regular ETA is 10am Pacific), try it out and let the Race Shop team know what you like about the feature. The combination of offerings resets every 6 minutes, shown by an on screen timer. Wait... what? This is a joke right? To someone like myself with 160 million credits and nothing to spend them on, a full catalogue of options would see me in the race shop 1 time only. At least this way it will give me something to do while waiting for a race to start in multiplayer and I see this as a much better option than the prize crates. Well, I prefer this rather than the loot boxes. Actually, is the reason to keep some atenttion on it. Without that reset /random factor, we will just go on there buy whatever we want and never come back. Covered in today's #ForzaMonthly livestream, the November 6 content update will remove Prize Crates and add the new Race Shop feature. any news on the force feedback update? only collisions were mentioned under fundamentals? Fantastic feature compared to loot boxes. Enough said. 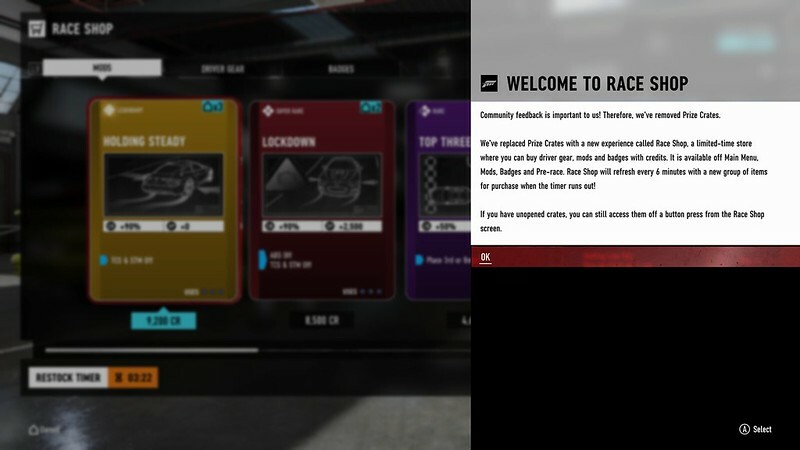 After using this new race shop since yesterday, all I can say is this feature is 1000 times better than the old loot boxes. Now you just enter the shop, see if something is specially relevant, buy it and wait for more cool stuff to appear. Really a nice improvement in the game. Thanks T10, when the things got fixed and improved I think it's fair to recognise it to the developers. Maybe it's a better feature if you don't own anything yet, but for someone who owns all but 20 suits it sure is a stupid change that just replaces one dumb feature with an even dumber one. What am I supposed to do, just keep the store page open for 48 hours and check every six minutes? Who comes up with these ideas as a result of listening to the community? Take note of GT Sport to see how to do it right. It should support the player, not annoy him. It's literally the same mechanic as the specialty dealer with a more annoying time limit. If this is the idea of making Forza great again, it failed miserably. Why do you need to grab what you don't have, all at once? Something to look forward to next time in the game. Big fan of the new feature. Already I find myself checking it before and after almost every race, and for some reason I have an easier time dropping big CR on driver gear than I do on cars. Definite improvement over the loot boxes and good to see Turn 10 make the change. I'd still rather everything to be available to purchase at any time, I'm not a big fan of randomness and having to wait around for a timer to finish. This is definitely a HUGE improvement over loot boxes. The only problem I have is my OCD is triggered when I do a long race and missed a few rotations I can't help but think I missed suits I really wanted. Not to mention how many rotations I miss when the game is off. I would improve this by making more items in the shop and rotating every 24 to 72 hours. That would solve my issue. This also begs the question, now that most cars are unlocked. Does this feature unlock most suits? Specifically the Forza game numbered suits? Logged in to fm7, checked race shop. There was a no requirement legendary 100% credit boost card, so I bought it. (Only let's you buy one at a time) it was only legendary offered at that time. Go in and that card wasn't available, there were 2 legendary cards that I didn't have interest in though. Just thought it odd, would have figured the items would be rotated the same for everyone. Doesn't matter, just odd. Turn 10 said in the live stream it's per player and not synced. Syncing it would have been nicer. Could tell a friend a certain driver outfit was in it for example. I like it, because mods with three charges are cheap and take way more than 6 minutes to be used up. But the best part is that I know what I'm getting. With the crates I'd often get junk mods I'd never use, which would stockpile and return little money upon a sale. Now, I buy only what I need, when I need it. Thanks for the ability to get the suits and badges with credits! Would be cool to know wich driver suits we shouldn't expect to be in the race shop-pool. So we don't wait hopeless for some suits. I just buy them for completion, i'm not really interested in these. The "Race Shop" has been well implemented. I like the fact that it updates rapidly. If I don't like the selection, I just have to wait a few minutes for another refresh. There's a good selection available. The prices seem fair and add a level of progression. I like it. I got the Tanner and M. Rossi suits last night one after the other 300 k each. This seems like a good idea, that actually works. No more spending 30g a pop for mod cards, 95% of which I will never use. Thumbs up. (Or T10 could remove mod cards all together then bring back difficulty based incentives).